Duration : 1 hour 45 mins. Can’t Pay! Won’t Pay! is a farce by Noble laureate Dario Fo. 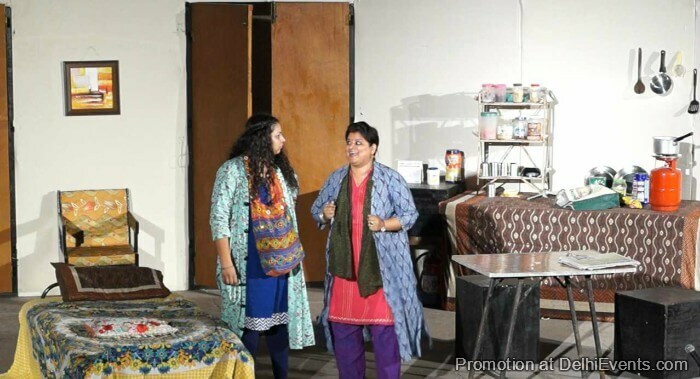 The play is set in an economically depressed working class neighborhood in India where food prices are skyrocketing. People are resorting to eating "Dog Biscuits", "Millet for Birds" instead of their usual gastronomical fare. The very funny physical farce gets rolling when Laxmi tries to hide the fact that she smuggled food out of a supermarket during a food riot from her husband Govind, who would rather "starve than eat stolen food. While stealing is objectionable in a society, is it not more criminal to see prices raised beyond people's ability to pay? In a world where eating is supposed to be a right and not a privilege, aren't horrible crimes being perpetrated by a society making eating problematical? This satirical play is about the social and economic injustice done to the plebeian society by the patriarch. The play is set in relevance to today’s time when unemployment and food shortage are latent and freedom of expression is supposed to be a right but really it isn't. Saksham Theatre Festival 2018 running from 08th April to 13th May 2018 at Aphitheatre, India Habitat Centre. The tenth annual festival will host elevan different plays of playwrights like Badal sarkar, Saadat Hasan Manto, Vijay Tendulkar, Peter Shaffer, Dario Fo and Lalit Sehgal, Mahesh Dattani, Friedrich Durrenmatt and Ashok Lal. Festival begins with the comedy of Badal Sarkar “Ballabhpur Ki Roopkatha” which revolves around a person Bhupati Rai who wants to sell his 400 yrs hunted palace. The other play of Badal Sarkar in the festival is ”Baki Itihas” an intense drama about the struggle of common people to be a part of history. “The Physicists” is a satirical drama by Swiss writer Friedrich Dürrenmatt, deals with the progress of the modern science and it’s impact on our lives. The festival also feature comedies like “Hasmukh Mehta Ki Wasiyat” a harsh yet comedic reflection of the patriarchal society, Dario Fo’s “Cant Pay! Wont Pay!” Which raise the question of unemployment, food shortage and freedom of expression and “Miyan biwi Aur Manto “a comical take on the sweet-sour relationship shared by husband and wife, Peter Shaffer “Black Comedy story of a Struggling sculptor Brij Mehta and his fiance, Kanti. Vijay Tendulkar’s “Khamosh Adalat Jari Hai” tries to touch upon the issues like unfulfilled desires, hypocrisy, gender discrimination, social customs and manifestations of power. While the Ashok Lal’s “ Ek Mamooli Aadmi” raises questions about our social, family relationships, bureaucracy and human values. “Gandhi Aur Godse”written by Lalit Sehgal , a never before insight on the life of Mahatma Gandhi and controversies surrounding Bapu’s ideologies and his assassination. Festival ends with Manto’s “Toba Tek Singh” based on Indo-Pak paritition.